Led by vocalist and lead songwriter Tiana Woods, the daughter of legendary 80’s pop and soul singer Stevie Woods, VARNA is the only unsigned female fronted rock band with not one but TWO consecutively charting singles, “Living A Lie” and “Survival of the Fittest” to hit TOP 40 on Billboard Mainstream Rock Indicator Charts. They have opened tours for major rocks acts such as Drowning Pool, Adelita’s Way, and Stitched Up Heart. They won ‘People’s Choice’ at the North American Rock Independent Music Awards and are in the running for “The Craving” as ‘Best Hard Rock Song’ at the 19th Annual Independent Music Awards. 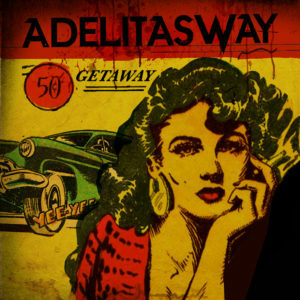 Pre-Order Adelitas Way’s Getaway now on iTunes HERE.